The title is a little misleading, but I couldn’t resist it. We moved house towards the end of last year and inherited three trees in the garden. One is a hibiscus, really easy to recognise because of the beautiful flowers. The other two trees were a little more difficult to distinguish. In December one of them blossomed with flowers similar to a pohutukawa. The flowering part of the tree is roughly eye-level with my office, and I enjoyed watching the tui get the nectar from the flowers early each morning. Once the flowers disappeared, I didn’t take too much notice of the tree until I came back from the stay in Australia. As I wandered around the garden it wasn’t difficult to notice we had a large amount of fruit in the tree and all around the trunk. Ah, the second tree was a fejoa. 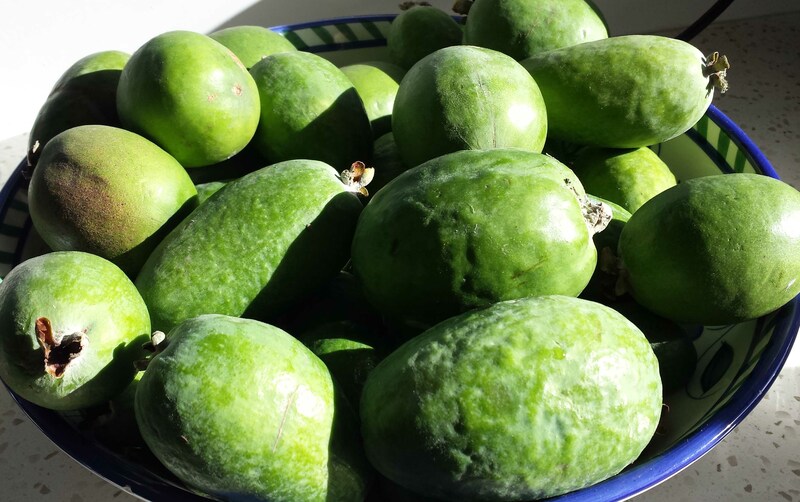 I hadn’t seen or heard of fejoas until I first came to New Zealand, but it is now one of my favourite autumn fruits. 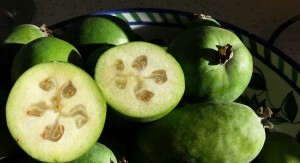 For a few weeks we enjoyed wandering out to the garden and picking the fruit. To be honest, to say we picked the fruit is making it sound harder work than it actually is. The fruit falls off the tree once it’s ripe, and as they have firm skins and you scoop out the inside you don’t even have to worry about climbing the tree. Easy! As for the third tree, the jury is still out on what it is!